Today's Draw: The Emperor from the Tarot of the Sidhe in the What's Working Against Your Goal position from Deck of 1000 Spreads. Do you have control issues? Is there a certain way you want things done and no other way can compare? Is there only one outcome to your goal that will satisfy? When I first starting doing this blog, my hope/goal was that I would write forever without repeating myself. Inevitably after 700+ blogs, though, I do. I really don't like to do it, though. And I'm on the verge of doing it again. And, in a way, that's what today's card combo is all about. Crowning Influences are major, kind of obvious influences on something, like a goal, as we have in today's reading. 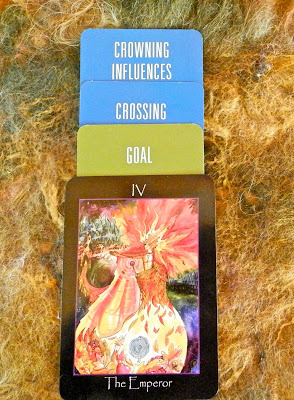 And the Crossing card is something that gets in the way of those influences on our goal...something that works against all the work we do, in a way of speaking. So the Emperor is what's working against the work we do. The Emperor is very yang. On the plus side, he's a leader and strategist. On the negative side, he can be very controlling. So by trying to control how repetitive this blog is or is not, I'm working against myself. It's like I assume all of you are like my sister, reading all 700 blogs in order (it's actually more than that, because I did this for six months on Facebook before I started my official blog), and committing each to memory (which I doubt she does...haha). It's as if I think everyone only needs to hear something once—and in one way—to get the message. Thinking too hard and trying to control what comes up is working against me....and has been for the past six months or so as I've felt I've started touching on some of the same "fine points" more than once. Sometimes we can be our own worst nemesis. Because also in that six months, I've come up with a couple of thoughts that I could really do something with if I wanted to write a book or ebook or something. So if I packed it in, I wouldn't have had those insights. Also, it's ludicrous to think any other than a small handful of people read every day or have been following me for all three years. So it's best to just let go and trust the right message is hitting the blogosphere at the right time, regardless if it's something I've talked about before. So here's the message FOR YOU—let go. Let chaos have its equal time. Embrace the random. Last week in the Lucky Like a Fox post, I talked about detachment, which is letting go of outcomes. Certainly when you have a goal, you have an outcome in mind. But resist the urge to have every little detail spelled out. Leave room for miracles. One thing I know for sure...god and the universe have a much bigger imagination and creative capability than you or I. Make room for them to meet you halfway and serve you something you could have never imagined on your own. Whether you have irrational control issues (like me) or are married to a certain specific outcome, loosen up and let the wind guide you to your goal.